The Ledger’s headquarters building in downtown Lakeland is up for sale, as is its office housing The News Chief in Winter Haven. Asking price for the 181,720-square-foot facility at the southwest corner of Lime Street and Missouri Avenue is $21,451,661. This article was updated July 31 to add the Ledger publisher’s Facebook comment, add new information about the Tampa Tribune’s building sale and clarify the status of The Lake Wales News. The San Diego-based Mansour Group of Marcus & Milchap Real Estate Group, which is handling the sale, tells potential investors that the 17-acre property is 100 percent leased to Ledger owners New Media Investment Group, which has 18 years left on a 20-year agreement. The lease provides a net operating income of $1.56 million, according to the property listing. The facility, built in 1998, is owned by a consortium of Little Rock, Ark., investors, according to Polk Property Appraiser records. Those investors are associated with Halifax Media Group, the company that bought The Ledger and its sister papers from The New York Times Co. in January 2012 and sold the newspapers to New Media Investment Group in January of this year. The investors bought the property in 2012 for $16.6 million, according to property records. The News Chief building at 455 6th St. NW in Winter Haven is also owned by an affiliated Little Rock company. The News Chief became part of The Ledger Media Group in March 2008. Asking price for the 5,481-square-foot building and 1.43-acre lot is $1,260,750. The 36-year-old building is also under an 18-year lease with annual rent increases, according to the listing. The News Chief building is listed along with six other smaller Halifax properties, including the Panama City News Herald and five North Carolina newspapers. 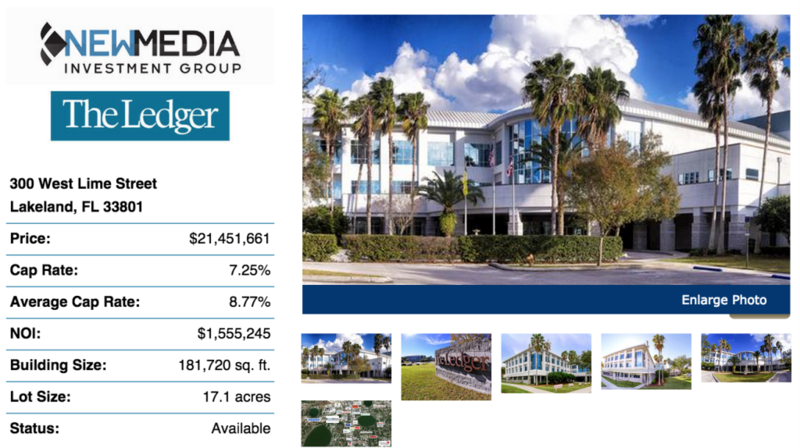 In March, Halifax listed the downtown headquarters of the Sarasota Herald-Tribune, known for its striking architecture, for sale for $18.1 million through the Tampa office of JLL, the Sarasota Observer reported. The 72,000-square-foot building, built in 2006, has room for multiple tenants of 30,000 square feet or more, according to marketing materials. Other newspapers in the Tampa Bay area have sold or are trying to sell their buildings as the newspaper industry contracts. The Tampa Tribune announced July 31 that its property fronting the Hillsborough River was sold to a Miami company planning a 400-unit residential complex. Terms of the sale to The Related Group were not disclosed. Tribune publisher Brian Burns said he is looking for a new location for the staff to move before demolition begins next spring and exploring options for printing the newspaper. “The sale of our property creates liquidity with cash flow, and will assist us in reinvestment into our circulation and marketing while also paying down debt,” Burns told a Tribune reporter. In St. Petersburg, Times Publishing Co. said in January the eight-story downtown headquarters of the Tampa Bay Times is for sale. Proceeds are expected to pay off a $28 million loan the company secured a year earlier. And on the south side of Tampa Bay, the Bradenton Herald’s 9-acre property and building on Manatee Avenue was sold in April 2014 for $3.36 million after the paper moved to smaller quarters nearby. The property was bought by a Palm Beach County that specializes in health care real estate development. Proceeds went to the pension fund of Herald owner The McClatchy Co.
Back in Polk County, part of the building at 140 Stuart Ave. that housed The Lake Wales News, a weekly newspaper, is listed for sale for $235,000. The property is owned by Derek Dunn Rankin, president of Sun Coast Media Group, the News’ parent company. Some Daily News operations have moved to the offices of sister publication, the Polk County Democrat, “but Lake Wales News is doing well,” Publisher Jim Gouvellis said in a Facebook comment.